On 1 January 1806 Elector Maximilian Joseph IV of Bavaria was proclaimed King Maximilian Joseph I of Bavaria. 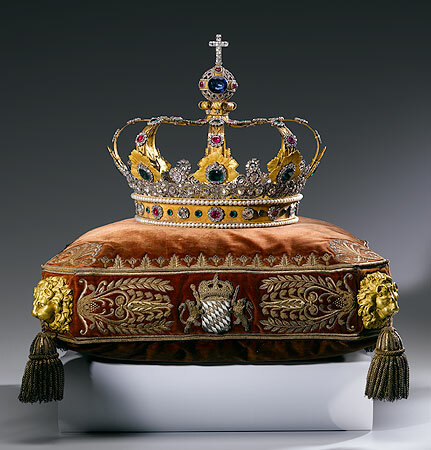 Royal insignia were immediately commissioned from craftsmen in Paris: a crown, sceptre, sword and belt, imperial orb and seal container for the king, and a crown for the queen. Among the artists at Napoleon's court who worked on the insignia was the leading goldsmith of the day, Martin-Guillaume Biennais. The insignia were duly delivered to Munich, but political events precluded a coronation ceremony. In fact, no king of Bavaria was ever to wear the crown in public. On occasions such as the accession of a ruler to his throne and his lying in state the insignia were presented on special cushions.